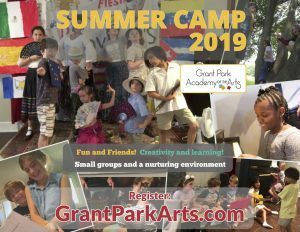 Grant Park Academy of the Arts is offering camps throughout June and July in music, art, creative writing, and nature studies. Our 9 – 4 camps for ages 5 – 11 (varies by session) are for kids who like to be creative and learn in small groups and a nurturing environment. For middle and high school age kids who already play an instrument, we have two week long sessions: Rock Band Workshop and Music Intensives.